Help the student to read aloud once a day for a minimum of three days. Help the student read by pointing to each word with his/her finger. What if the student encounters an unfamiliar word? Ask him or her to guess the word from a picture that illustrates it or gives a hint about its meaning. Also, have the student read the word by identifying the beginning sound of the word and by using other phonics methods. Ask the student to talk about the story. Do not ask the student to identify the main idea unless he/she is in first grade or above. Praise the student for any content that he/she remembers correctly, even if he/she may not remember everything from the book. Ask the student which part of the book was the most interesting. Have the student write a book report. Instead of requiring them to write a detailed summary, have them write about the main character and what the main character does. In the beginning, it is important to allow the student to use sentences directly from the book and to refrain from correcting spelling errors too vigorously. Help the student to read silently once a day for a minimum of three days. Picture books can help the student develop an active imagination. The time from second to third grade is a crucial period during which reading habits are established. It is important to have the student create a reading log so that he/she can feel enjoyment and a sense of accomplishment. What if the student encounters an unfamiliar word? The student should try to guess its meaning before consulting the dictionary, especially if the word is a verb. Ask the student to talk about the story. Ask the student about the characters and setting. Ask the student what he/she learned from the book. Have the student write a book report. By second grade, most students can understand the physical setting and time in which the story takes place. In addition, they are able to summarize the contents of the book using their own sentences instead of sentences taken directly from the book. Character Study – Have the student interpret the characters’ personalities and actions and write about them. Have the student write a summary of each chapter and a summary of the entire book. Have the student analyze and compare various books by the same author. Have the student write a book report. The student must be able to express his/her personal views about the conflicts that occur in the story and the characters who try to resolve them. The student should also be able to summarize the contents of nonfiction books in addition to those of storybooks. 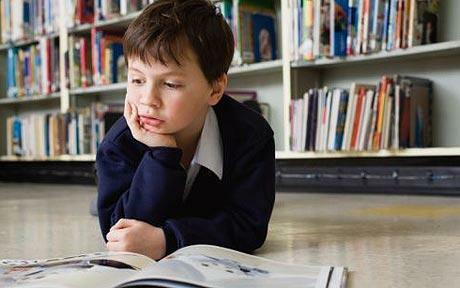 When students read a book for the first time, they are likely to be curious about the events in the story and how the story ends, thus focusing most of their attention on the plot. The hidden meanings and subtle details of the story that emerge upon a second or third reading ultimately enable students to exercise their critical thinking skills. In addition, studying the new vocabulary from the story is more effective in the second or third reading than in the first reading. For students in second grade and above whose books contain a high volume of content, reading a book aloud may hinder comprehension. In such cases, students must read the book silently after reading it aloud. Doing so enables them to practice their articulation and comprehension at the same time. For students in the lower grades or ESL students who need to improve their pronunciation or presentation skills, reading aloud is strongly recommended. CALL US at 310.909.4441 or FILL OUT the form below for more information about our programs. Founded in 1986, ReadingTown has become a globally renowned learning center and content provider, reaching out all over the world with quality educational programs, systems, and materials. We are the right answer to your children's education. We give not just promises, but also actual results. Copyright © 2019 Reading Town. All rights reserved.